Outback Jacks are hosting a FREE Vango family camping weekend June Bank Holiday Fri 1st to Sunday 3rd at their shop in Ballybane. Everyone welcome to come along and meet Vango professionals the original manufacturer of famous Inflatable family tent and get the latest on Inflatable family tents. 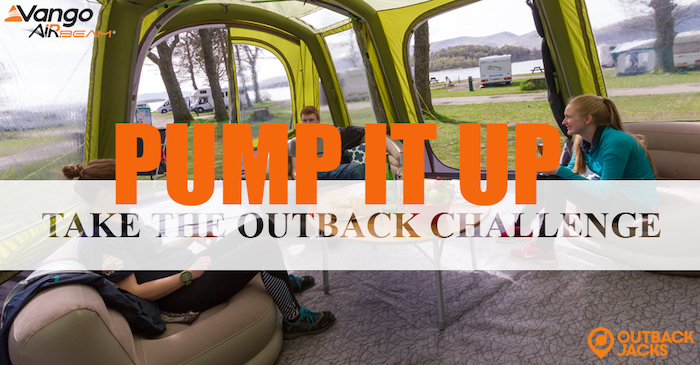 Fancy getting some FREE Vango camping product then take the Vango Pump it Up Airbeam challenge, the persons with the quickest pump up time of a Vango tent wins the challenge and gets the prizes. What is an Airbeam Inflatable Tent? Not heard of inflatable AirBeam® tents before, you will be amazed by how simple they are to pitch. This advanced camping technology from Vango is so quick and easy to pitch; one person can inflate an AirBeam tent or awning within minutes. Camping solo with the kids or simply want to get your holiday off on the right foot; an AirBeam tent will make pitching and dismantling a breeze. If your thinking of purchasing an Inflatable family tent don’t miss this opportunity to grab yourself a bargain and get special pricing on all Inflatable family tents, campervan and caravan inflatable awnings. Outback Jacks stock a full selection of quality camping product and brands from Cadac BBQ, Igloo Cool boxes, Camping Wardrobes, Camping chairs, Bamboo tables, Single & Double sleeping bags, Self Inflating mattresses, portable toilets camping extension leads with USB chargers. Deposits taken, Open seven Days. Free Parking. Visit our showroom in Ballybane this June bank holiday weekend.